Normally, Charity stamps show two denominations: one shows the franking value of the stamp and the other shows the Charity premium paid in addition to the franking value. So "250 + 250" means that you pay 500 but get 250 in franking value. This can get complicated, especially when there is inflation and revaluation happening as in 1922 - 23 Russia. 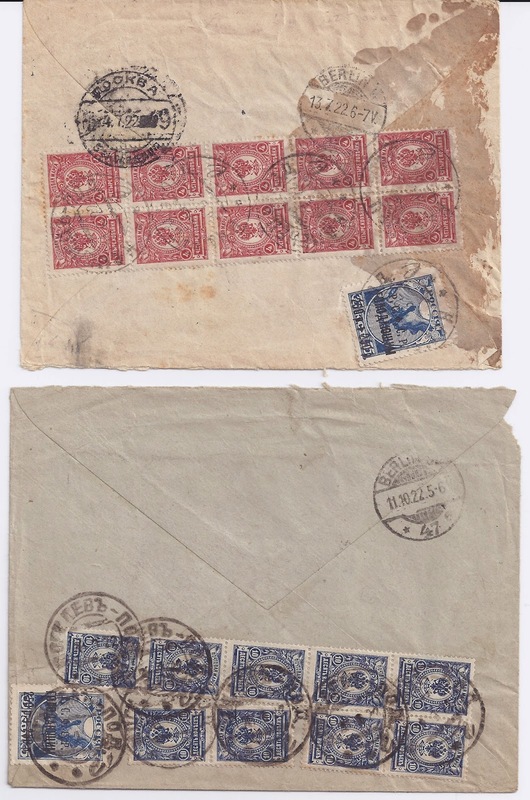 On the two covers below the correct franking is paid entirely by the regular Imperial adhesives and the Volga Famine Relief Charity stamp does not contribute to the franking total, though presumably the sender paid something for the it - perhaps 250 x 100 ( = 25 000 ). I don't know. The first cover was Registered from KAMENETZ - POD 24 6 22 and travelled via MOSKVA 4 7 22 (where the Censor opened it) to BERLIN 13 7 22 (though it's not a Brender cover). The Tariff of 4 June 1922 has been applied and the letter charged at 400 000 roubles and the franking fully and correctly provided by the 10 x 4 Kop x 100 x 10 000 twice revalued Imperial stamps. The second cover was Registered from MOGILEV-POD 28 9 22 and arrived in BERLIN 11 10 22 - this one is a Brender cover. The Tariffs of 1st July and 15 September would yield the same result: the letter should be charged at 900 000 roubles - and it is, using 10 x 10 Kop x 100 x 10 000 twice revalued Imperial stamps.